Skopje — Macedonia’a Orthodox Church on Friday ordered its priests and nuns not to use Facebook or be ready to face unnamed sanctions, church officials said. “Everyone among the clergy will face sanctions if using Facebook,” the church’s spokesman, Bishop Timotej, told reporters. The ban seemed to show the rift between senior and junior priests, who have often used social networks to attract younger generations to the church by offering them religious education and advice. However, some of them also expressed their personal views on the political situation in the country, sometimes criticising the government. Although they are officially separated, the church has gradually increased its influence in state affairs since Macedonia proclaimed independence from the former Yugoslavia in 1991. The Macedonian Orthodox Church split from the Serbian Orthodox Church in 1967 and has not been recognised by other Orthodox churches. 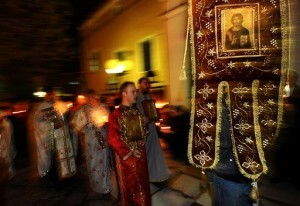 Most of Macedonia’s Christians are Orthodox. They make up three-quarters of the country’s population of 2.2 million. Ethnic Albanians who make up around one quarter of its population are mostly Muslim.